Any backpacker travelling around South America will inevitably end up on the Inca Trail to Machu Picchu—it is the Mecca of the Gringo Trail. 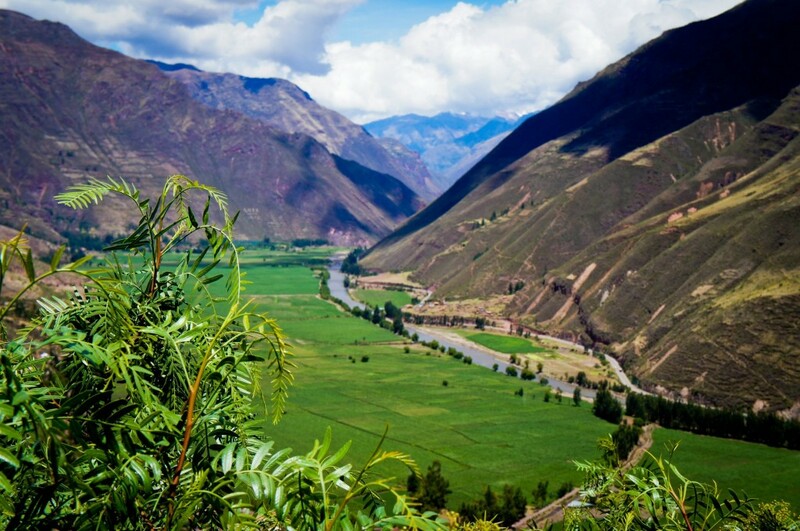 Many will opt to trek for a few days, and the more hardened may even trek for five or six, camping along the way, in order to take in the pinnacle of the Inca Empire’s achievements; the famous citadel in the clouds. The jumping-off point for many tours to Machu Picchu is Cusco, the historical capital of the Inca Empire, now a UNESCO World Heritage Site. At only 80 kilometres away from the site, travellers can access Machu Picchu on foot or by train—there is no road that leads directly to the area. Much as I would like to say that I walked the Inca Trail into Machu Picchu, I have to admit that I took the lazy option. This is completely due to the fact that I still have problems with an ingrown toenail (incurred by a bad pedicure in Jakarta) and can’t wear closed shoes without excruciating pain. So I booked a two day tour—the first of which would take me through the Sacred Valley into Ollantaytambo where the train leaves for Aguas Calientes. After a night in the tiny village we could take a short bus ride up the mountain to the famous ruins. In booking the tour, I made a big mistake—to my detriment, I took the cheapest option available. As travelling around South America has been far more expensive than I envisaged, and as the option of hiking the trail was not available to me, I thought that I should shop around for the cheapest deal. This was a huge mistake. In visiting Chaska Tours, just off the Plaza de Armas in Cusco, we found a tour for the bargain price of $200. This all sounded pretty good but I had a few reservations. 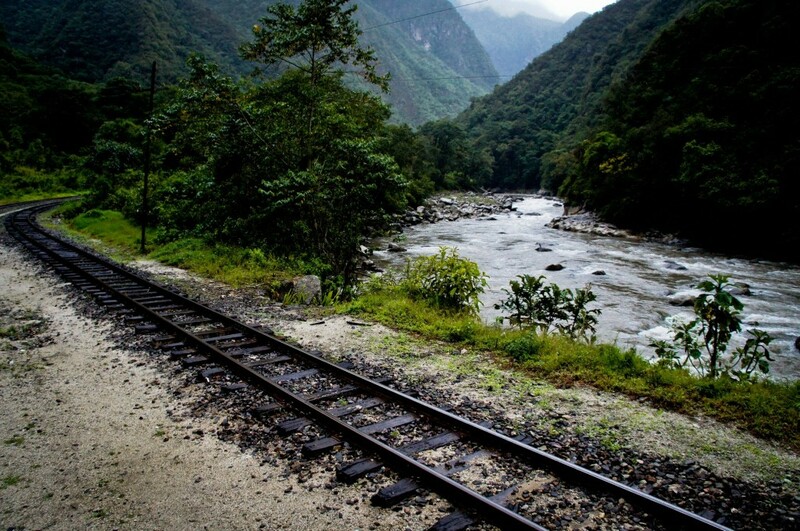 Firstly, both our train journeys to and from Aguas Calientes would take place in the dark. I mentioned to the operator that I had heard the journey was exceptionally beautiful and wondered if we would be missing out by going at night. He confidently told me that the journey was not very exciting at all and it would not matter. We then asked who else was booked on the tour in order to work out if we would have other English speakers to talk to. He assured us that he had just booked a large group from America, so we would have no problems in that area at all. Reassured we booked the tour. It turns out that he lied to us. The tour began with a bus that picked us up from our hostel and then wound its way around the tiny streets of Cusco picking up all the other (non-English speaking) people for the tour. Our first stop was a traditional Peruvian market selling all the usual coloured bags, alpaca sweaters and silver jewellery. 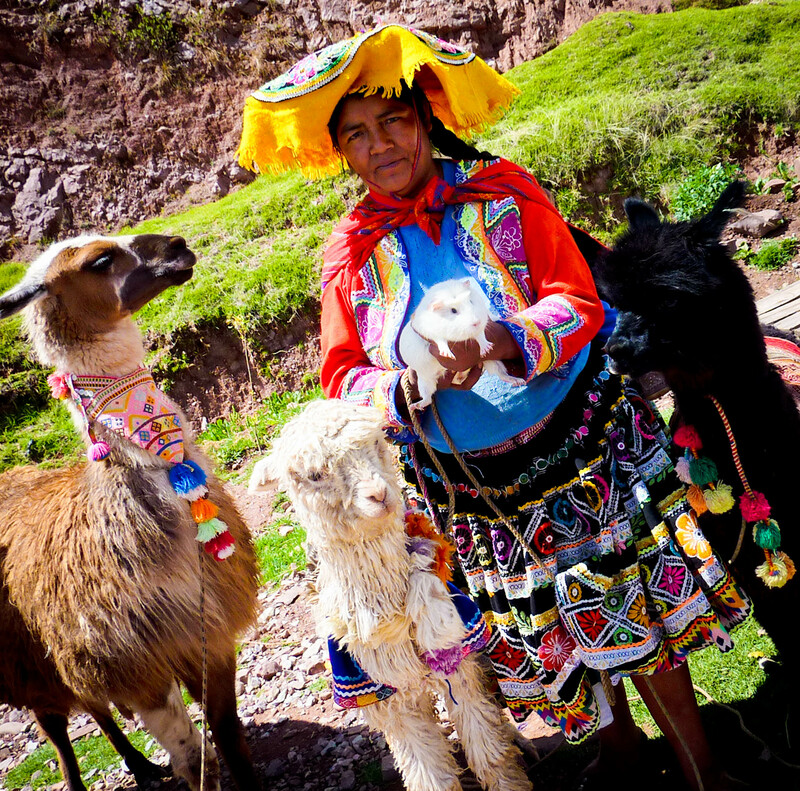 Peruvian handicrafts are beautiful and I would love to buy more trinkets, but after buying too much at Lake Titicaca I had learnt my lesson and went to stroke the resident Llama instead of looking around. 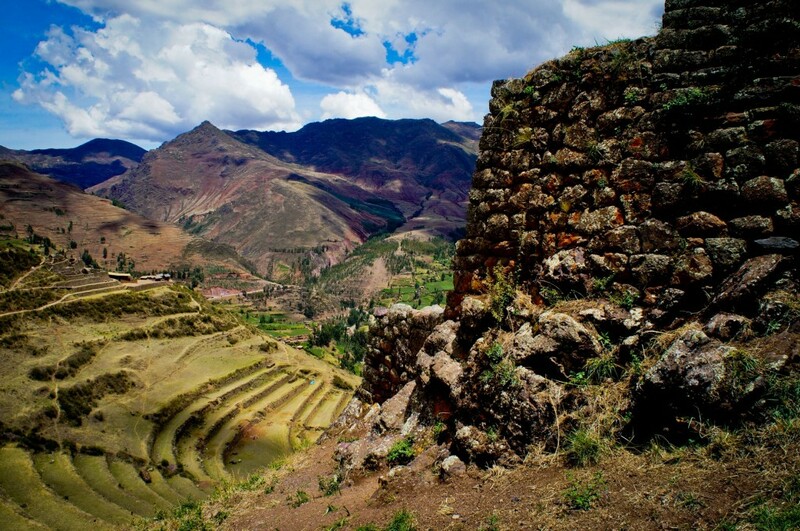 After the market we stopped at the remains of the Inca Temple of the Sun in Pisac. In order to visit many of the Inca sites in the Cusco region, travellers have to buy a tourist ticket which costs 120 soles for 3 days and 70 for 1 day. We hadn’t purchased this ticket but our guide managed to secure us entrance for only 35 soles each. He then gave us one ticket that was valid on the 25thOctober (2 months earlier) so it seems that this was not a legitimate ticket but we got it nonetheless. The site was pretty impressive, boasting perfectly-lined, lush green terraces and rocky walls set against a backdrop of stunning mountainous scenery. With fluffy clouds scudding across an azure-blue sky, it could not have been any more picture-perfect: our hopes could not have been higher for Machu Picchu. Our traditional Peruvian buffet lunch turned out to consist of salad, spaghetti bolognese, potatoes, chicken curry and chocolate flan. Although it was good, I was a little disappointed that I didn’t get to try Peru’s specialty, guinea-pig (or anything remotely Peruvian in fact). Shortly after lunch we arrived in Ollantaytambo where we were informed that we could visit another Inca site. Unfortunately, the tour operator had failed to mention this to us, and as the site was another site where we would need to use the tourist ticket that we hadn’t purchased, we didn’t go in. Instead we took our bags to a small café to eat Banoffee Pie and use their internet until our train departure at 7pm. Trains from Ollantaytambo to Aguas Calientes are operated by Peru Rail or Inka Rail, and a number of different classes are available. As we had booked the absolute cheapest journey, our train was full, our seats were not together, and the only view from the window was of the blackest night. The journey was long, uncomfortable, and—thanks to the non-stop snogging of the Colombian couple sitting opposite me—downright unpleasant. I was pleased to get off. When we disembarked from the train it was dark and a hoard of hostel representatives holding up named placards of their expected guests’ names bustled around the disorientated tourists. We looked around for ours. Our names were not written on any of the boards that we could see and when we asked about Los Rocas Hostel we were told that their representative was not there. Consulting a map we set off to find our own way by torchlight. After getting lost in the market and walking up a steep, winding hill—ignoring the cat-calls of various pizzerias and drinking establishments—we bumped into a young man coming out of a restaurant. In one hand he was holding a large bag of bread rolls, in the other he had a placard that clearly stated our names. For some reason he must have decided that he did not want to go all the way to the station to meet us, instead he would catch us as we made our own way to the hostel and we would arrive together so it would look like he had done his job properly. (Trip Advisor confirms that this is a common occurrence). We had been told that a guide would meet us at the hostel to give us necessary information about our tour of Machu Picchu the following morning. After checking in, we turned expectantly to the staff members sitting around in the hostel reception area. Nobody said a word to us about a guide and as they didn’t seem particularly friendly we went to our room, expecting that somebody would come and knock on the door to tell us that the guide had arrived. This posed a problem. We had been told that we would be given a 2-hour guided tour of Machu Picchu the following day, but with no guide to tell us what time to get there we had no idea which bus we should get. We decided to worry about it the following morning and went to bed. Did any guide come for you? Did you get there the next day? Great explanation of Sacred Valley of the Incas. people will definitely love to visit.